In recent years, many advances have been made to ergonomic solutions in manufacturing facilities around the world. Oftentimes, companies will introduce ergonomic solutions to improve efficiency and productivity. But, many companies are also introducing ergonomic hazard control solutions to reduce worker’s injury risks. One important tool safety engineers and production managers use to minimize or eliminate worker exposure is the hierarchy of hazard control. This simple hierarchy allows facilities to select the most appropriate control to reduce hazards identified in the workplace. 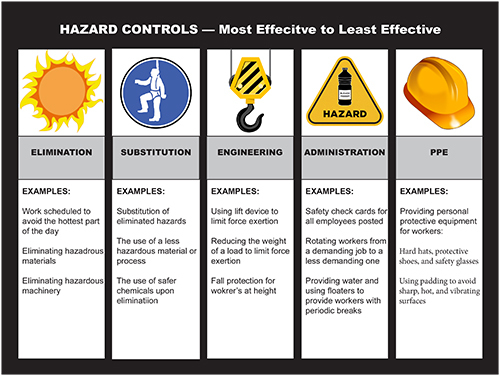 Many of these hazard control solutions include simple interventions, like elimination or substitution, modifying existing equipment, purchasing new tools or lifting devices to assist in production, and changing daily work practices. These kind of changes help to eliminate unnecessary (manual) lifting, reduce worker’s physical demands, lower injury rates, and reduce compensation costs and employee turn. Ergonomic hazard control solutions like these have become an innovative and effective way to improve safety across the board, but they also consistently improve productivity in most cases. Many facility managers don’t realize how many simple, low-cost solutions are available to solve their factory problems. But, it’s also important to note that—like most systems and solutions—the hierarchy of hazard control works best when used correctly. The first step to hazard control in the workplace is to provide a written workplace hazard program, which determines the methods that are already being used to control the hazard and how these control can be monitored for ongoing effectiveness. According to OSHA’s “Solutions to Control Hazards”, the best way to reduce the chance of workplace injury is to design work tasks that limit exposure to ergonomic risk factors. This includes engineering controls, administrative or work practice controls, and personal protection solutions. But, to take it a step further, we’ve also outline two additional hazard controls: elimination and substitution. Elimination and substitution are perhaps the most effective and easiest methods to reduce workplace hazards. This requires safety engineers to remove the hazard from the workplace, or substitute hazardous practices, materials, and machines with less hazardous ones. Eliminating the hazard from the workplace is a highly effective means to control risk because the hazard itself is not longer present. It is the most preferred method of controlling ergonomic—along with other types of—hazards. Substitution, on the other hand, is used to introduce a new chemical, substance, or practice that is less hazardous than the previous ones. Substitution is often grouped with elimination because substitution also involves removing the original hazard from the workplace. The goal is to choose a new chemical, practice, or substance that is less hazardous than the original. Establishing systems that ensure workers are rotated away from tasks to minimize the duration of ongoing exertion, repetitive motions, and awkward/uncomfortable positions. Starting at the top of the hierarchy: faced with workplace hazards, companies often look for the easiest, least expensive solution, such as (PPE) personal protective equipment—see below for more information about PPE. PPE is appropriate for some hazards, but it is the least effective control in the hierarchy, which is why it’s at the bottom. The hierarchy outlines its control methods in order of importance. That means, the control methods at the top are typically more effective than those at the bottom. PPE and some administrative controls may be less expensive solutions, but elimination, substitution and engineering controls can have a long-term impact on preventing injuries and accidents. Administrative controls, including safety training, are essential to workplace safety. But they cannot replace all other controls, which are oftentimes arguably more effective at reducing workplace hazards. Training doesn’t eliminate hazards or reduce worker’s exposure to them. Consider the control at the top of the hierarchy first—or in addition to—administrative controls. ​Although lean manufacturing and ergonomic settings are often the most effective means of manufacturing, there are many control hazards that need to be addressed in an ergonomic setting. Ergonomic solutions to control hazards are not only easy to implement, but they also protect workers from injury, reduce workplace hazards, decrease worker’s compensation, and improve worker responsiveness and productivity. If you consistently and correctly use the hierarchy of hazard control tool correctly, you are bound to create a safe, healthy, and happier workplace for all your employees.